Why do I have the error "Update Wizard not initialized properly" when trying to run the Update Wizard for Total Visual Agent? – FMS, Inc. Does Total Visual Agent support a scheduling based on 1st business day of the month? 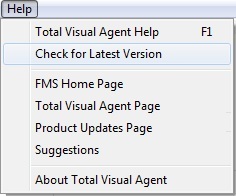 Does Total Visual Agent Compact the Back End Database in a Microsoft Access Split Database Architecture? How do I troubleshoot Total Visual Agent issues with running the Service? Why do I have the error "Update Wizard not initialized properly" when trying to run the Update Wizard for Total Visual Agent? Total Visual Agent lets you easily schedule and execute the repetitive tasks your databases need. Schedule a wide range of tasks and run them in a fully automated and audited manner. Set start times and end times, and receive emails if anything goes wrong. This error occurs in Total Visual Agent when you attempt to run the Update Wizard by double clicking the "Update.exe" directly instead of running it from the Windows Programs Menu shortcut. This is because the update.exe file requires parameters to run and return the correct information. In order to determine if there is an update available for this product, please run the update wizard program from the Windows Programs menu or Windows Metro menu.